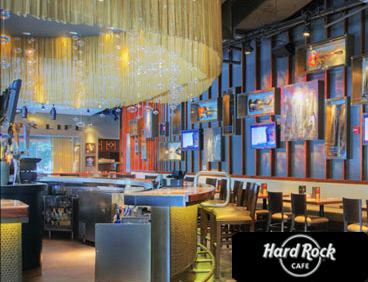 When you visit the Hard Rock Cafe in Dallas, you will find an enormous restaurant, with over 8,900 square feet decorated with contemporary décor and highlighted by rock n roll memorabilia lining the walls. This 265-seat restaurant offers both indoor and outdoor seating, giving you the opportunity to take advantage of the great climate in the Dallas area. 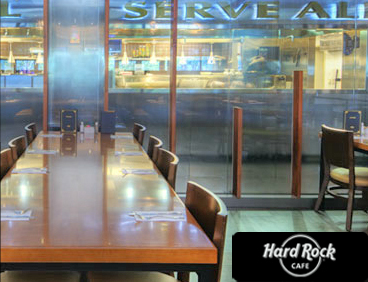 While you are enjoying the legendary burgers or other savory menu options at the Hard Rock Cafe Dallas, you can peruse the rock 'n roll memorabilia lining the walls and enjoy the great rock tunes playing throughout the restaurant. Before you leave the Hard Rock Cafe Dallas, be sure to stop by the Rock Shop, offering you a range of rock 'n roll memorabilia and limited edition Hard Rock Cafe merchandise for purchase. You will have a simply marvelous experience on your trip to the Dallas Fort Worth Metroplex when you take in the culinary experience of dining at the Hard Rock Cafe Dallas. 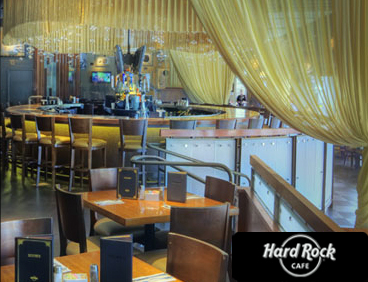 Don't miss your chance to dine at the new Hard Rock Cafe Dallas on your trip to the area!